A new features is being tested over at Twitter. It looks awfully familiar … like something we’ve seen over in Facebook. This new feature shows which of your friends on Twitter follow the same people you do. So, if you follow @tjohansmeyer, as does one of your friends, you’ll see your friend listed as someone who follows @tjohansmeyer when you view the profile page. It seems a lot like the Facebook fan page feature that shows which of your friends also “likes” a particular page. This entry was posted in social media and tagged Faceboo fan page, Facebook, social media, social networking, Twitter on June 3, 2010 by Tom. 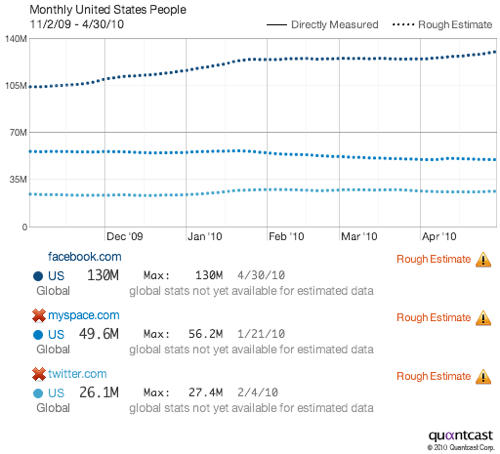 Facebook’s rapid ascent continues. Next month, the white-hot social media company is expected to announce that it has more than 500 million users, according to the blog All Facebook. This will make Facebook the first to hit the half-billion mark. The announcement is expected to take place before June 25, 2010, and plans are in the works for a big celebration – for a company that typically eschews feting its accomplishments. And, its prospects for year-end are even brighter. All Facebook forecasts more than 600 million users and $1 billion in annualized revenue. Only a year ago, Facebook had a “mere” 175 million users. This entry was posted in Media, social media, technology and tagged Facebook, social media, social networking on May 18, 2010 by Tom.